The Season of sacrifice is upon the 1.2 billion Catholics in the world in the remaining 37 days or so. 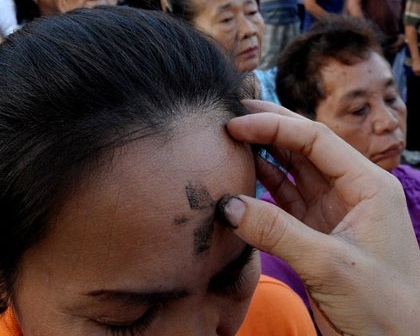 Starting from receiving ash on their foreheads on Ash Wednesday, the faithful once more begins the pilgrimage from Lent, a 40-day season of self-examination, fasting and penance in preparation for Easter Day observance. For many, Lent means “giving up” something that lends to pleasure and enjoyment. Religion, to most, is something personal. How we live our lives guided by our beliefs from catechism or bible study is usually not debated. Beyond this, Christians and Catholics go by the rituals they prefer to exercise. Incredibly ingrained in our lives each year, are Christmas and Lenten traditions. When one of my sons asked me ‘what are you giving up?’ I groped for an answer not expecting this question from a teenager. It was a far-fetch thought that the youth, distracted by the social media and web, would have a space for Lenten tradition in their lives. In fact Facebook reflects “likes” among “friends” who forego movies, snacks, chocolates, while those 21 and above strive to do away with cigarettes, alcohol for the next month and a half. Really, they are mindful of this church tradition? He doesn’t really like chocolates, soft drinks and doesn’t smoke anyway. “So I guess, I will give up meat on Fridays,” he said. “I’m giving up a score of faves of the past: my favorite ice cream (ube); going out to the movie(s)” and art performances during the season. I may even return birthday gift tickets to see Music Center performances,” said the veteran news columnist Ludy Ongkeko. Evelyn Portugal, advertising manager of the Beverly Hills Courier, who is a self-confessed chocoholic, has given up chocolates. “I take one chocolate bar a day (from the office concierge) and put it away. At Easter I am afraid I will have to devour them all,” she laughed. For real, that’s the test of one’s religious resilience.